The poster BECAUSE WE CAN is a homage to the Voyager-Record-Picture Number 70 „Mountain Climber“. About the picture and why it was chosen to be send out into the unknown with the Voyager space probe, John Lemberg states: „This picture shows the French Climber Rébuffat atop a spire of rock in the Alps. If the recipients recognize the silhouetted human figure, they may guess that it was both difficult and seemingly pointless to scale this rock needle. The only point would be the accomplishment of doing it. If this message is communicated, it will tell extraterrestrials something important about us.“ (In: Sagan, Carl: Murmurs of Earth, 1978) This photo and the explanation always fascinated me and also I definitely wouldn’t say, that a manned mission to mars is a pointless venture, I still like the notion, that humans do things just because they can. 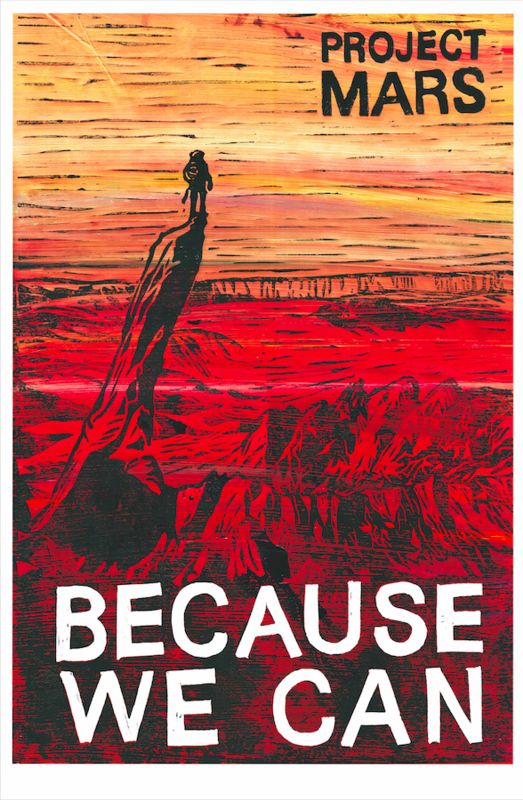 Unter dem Titel Project Mars hat die Organisation SciArt Exchanche gemeinsam mit der NASA zu einem Plakatwettbewerb aufgerufen, der die künftigen bemannten Marsmissionen illustriert. Mein Beitrag BECAUSE WE CAN wurde unter die 26 Finalisten des Wettbewerbs gewählt.